The much awaited moment of my Motor-biking trip to Bhutan has come. It is 9 am, but the roads of Paro are still deserted. Unlike us, the people here are in no hurry. 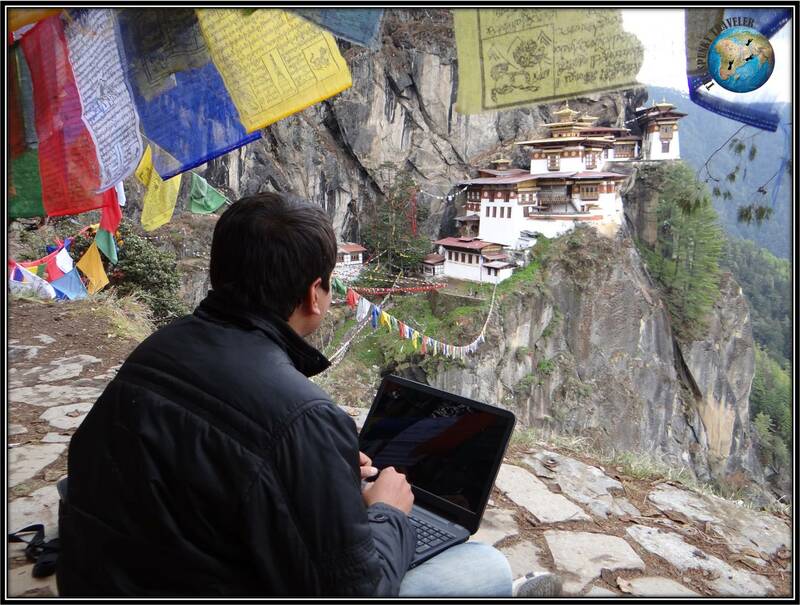 It takes me a while to adjust to the laid back Bhutanese lifestyle. Few people have gathered around a huge prayer wheel to offer morning prayers. The only sound that echoes at this hour is that of a tiny bell which clinks each time the prayer wheel comes a full circle. 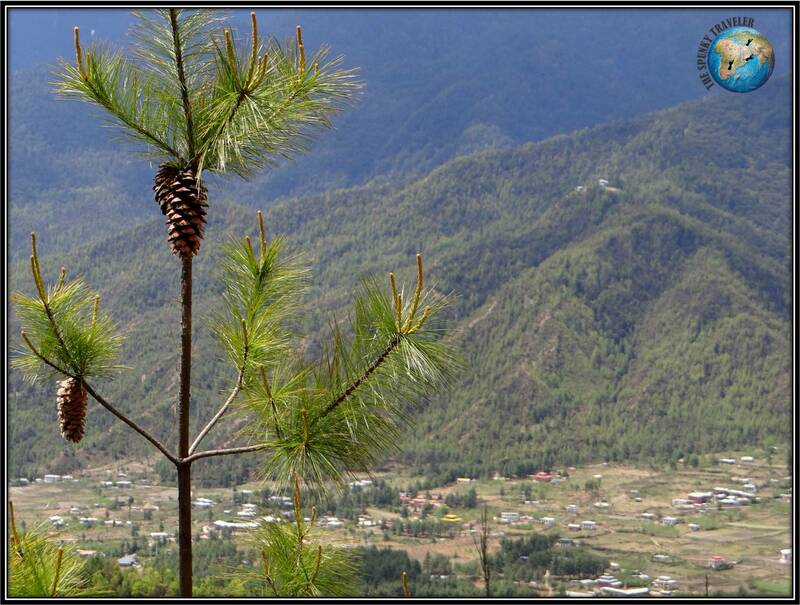 The road that branches out to The Tiger’s Nest is about 10 km north of Paro town. ‘Paro Chu’ (Paro River) flows along with me majestically as I ride slowly through the villages and an occasional apartment built in Bhutanese architecture. I see few school children walking on the road in traditional Bhutanese Kira, happily chatting to each other. They wave to me as I pass by. I take the road bifurcating from the main and drive for another 1 km through villages and cross a bridge adorned with colorful flags over ‘Paro Chu’. I am meandering through the dense forests of gargantuan pine trees and already breathing inconsistently because of the excitement. The people selling local souvenirs, although do not have all the luxuries in life, but they are definitely very happy. I see them chatting to each other with big smiles. They call on me and ask if I would like to buy something but, to my surprise, do not push for anything. The contentment in the aura has started to build up a constant smile on my face. 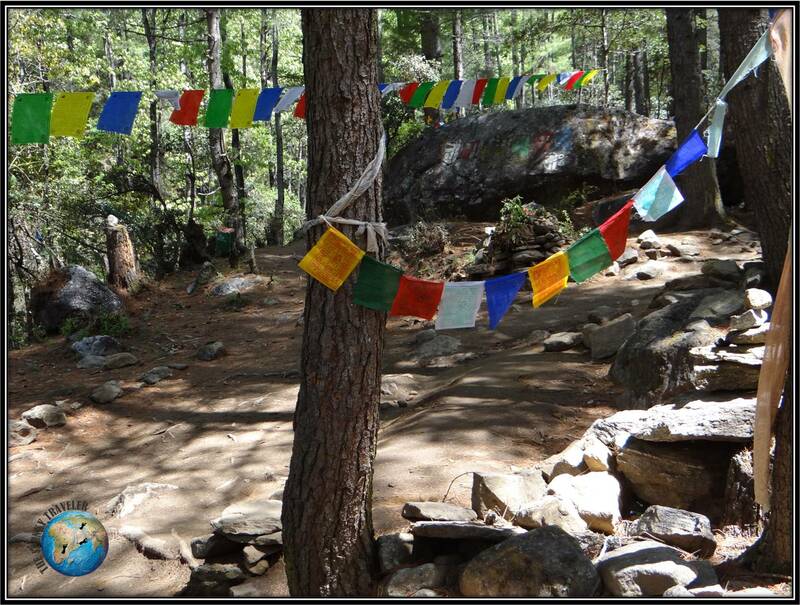 During my trek, I come across clearings in the forest where trees are tied to each other by colorful Buddhist prayer flags and the stones are painted with ‘Om Mani Padme Hum’ in Dzongkha language. The trek is not as treacherous as it seems. The path through forests has been used for years by travelers and is well beaten. Occasional beams of sunlight dart through the trees making a round spot on the path under my feet. I relive my childhood and the euphoria of watching the dust particles sway around in beams of sunlight that stormed into our house through the cracks between curtains. The path has become more difficult now, and although, the local guides are walking with ease, I am panting hard as I am walking. I stop at many places to admire the beauty of Paro valley below while I breathe in gulps of fresh mountain air letting it soothe the cry of my city-sick lungs. 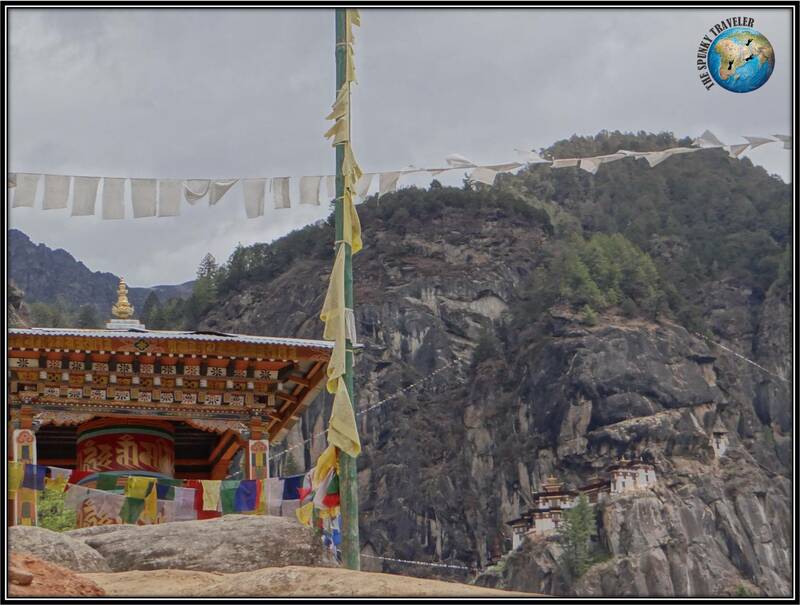 ‘Taktsang Monastery’ (Tiger’s Nest) is where ‘Guru Rinpoche’ (Padmasambhava) flew on the back of ‘Yeshe Tsogyal’, wife of an emperor who transformed herself into a tigress. 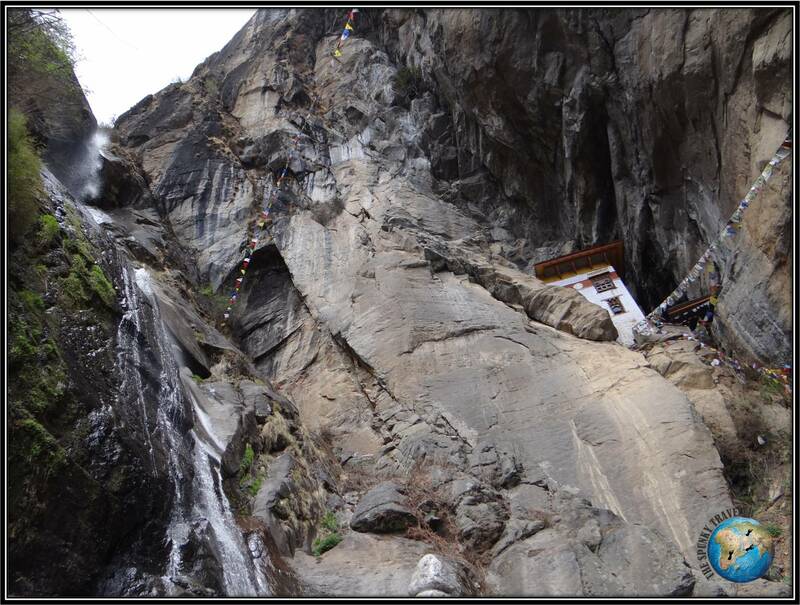 Guru Rinpoche came from Tibet and meditated in a cave near Tiger’s Nest before introducing Buddhism to the whole valley. It is said that during the end of his meditation, Guru Rinpoche transformed himself into eight incarnations. These incarnations can be seen in monasteries across Bhutan. An hour of hiking brings me to the only cafeteria. I have had a good breakfast but I am starving right now. While I sit sipping black tea and watching amazing views of the monastery, a cat gently climbs up on my lap and asks for a biscuit. It so amazing that the aura of a place has its effect on animals too. The animals here don’t feel threatened by humans. Rather, they will walk up to you and ask for the love they know they will get. I end up having a heavy lunch which shows its consequences once I start climbing further. The path from cafeteria to the monastery is more steep and I have to take frequent breaks. Another hour brings me to a clearing filled with prayer flags. After that starts the descend to the monastery. I stop and drink some water at a waterfall on the way. No mineral water can match its purity. I find a neat spot to sit and just type down my thoughts as the cold mountain air whizzes through my hair. Can there be a better place to put down your thoughts? Tippy Tip: You will have to deposit your camera, laptop, shoes and wallet at the entrance. There is only one locker with a lock. If you are carrying something very precious, use it. Rest of the lockers are open. No one steals anything in Bhutan. Once inside the monastery, the silence is so deep that it is almost screaming at me. I sit on the wooden floor and look outside the window as clouds descend upon the monastery engulfing everything. I come from India, and I know what an incense stick smells like. However, the fragrance of the incense sticks here is distinct. Something that I have not experienced before. In eastern cultures, temples were made at places which were difficult to reach. It is believed, that all the effort that you put in reaching that place clears your mind off any ill thoughts and prepares you fully for the pilgrimage. The last three hours spent on the mountain were tiring and knocked the wind out of me. Probably, it even knocked out all the negative thoughts for me to fully experience the sound of silence. 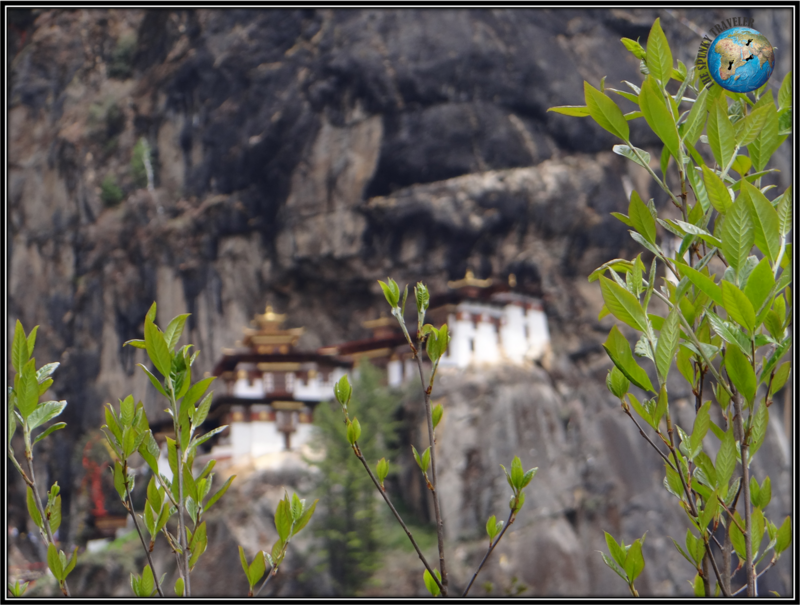 Have you been to the Taktsang Monastery? I would love to listen to your experiences.